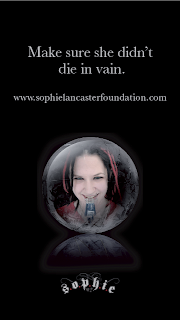 For all of you who, like me, have been touched by the Sophie Lancaster: A Dark Angel film, I am delighted to bring you this video from the night of the film launch in Manchester Cathedral Gardens on 26th November 2009. It includes an interview with Julian Kynaston, founder of Illamasqua, and other key figures in the making of the film. Please leave us your comments about it if you feel the need to so and I will make sure that Sylvia and Julian see them.